The big hitters are the EX-FS10 and EX-FC100. The former has a 9.1-megapixel sensor and 3x optical zoom. It’s 16.3mm thin, and has a 2.5″ LCD display. 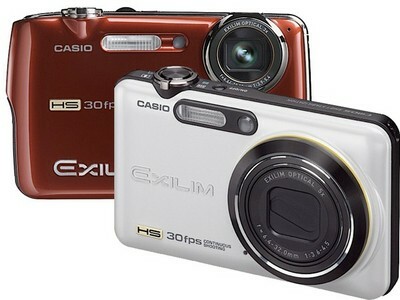 The latter is also 9.1 megapixel, and expands to a 5x zoom and 2.7″ touchscreen. It’s also got CMOS anti-shake. Impressively, though, they can both capture at amazingly high speeds – 30 shots-per-second 6-megapixel still images, and movies at up to 1,000fps. That speed is going to good use, too – you can set it to take a burst, and automatically pick the least blurred, smiliest, eyes-open photo, or you can pick the best one yourself. It’ll also do 720p HD video. $350 (£231) for the EX-FS10, and $400 (£264) for the EX-FC100, both out in March in the US.